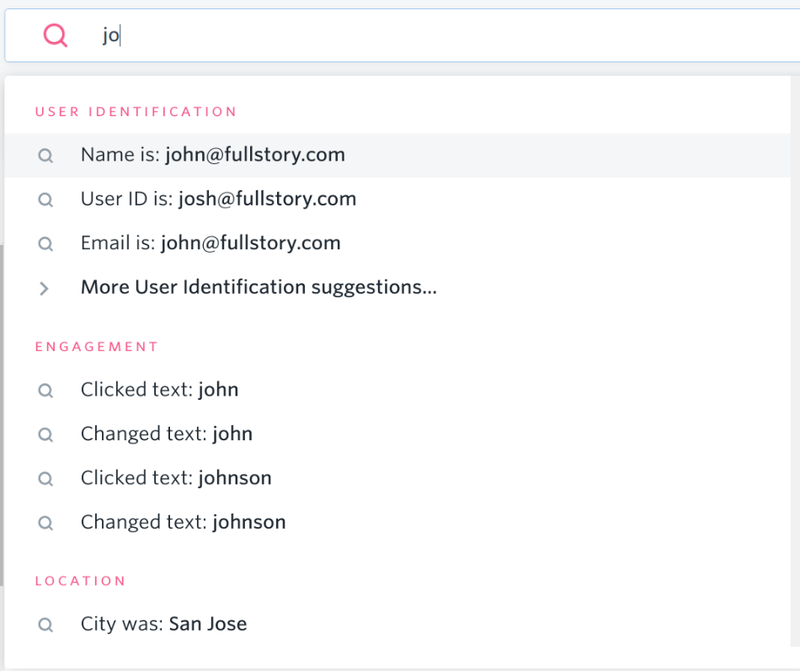 Virtually anything about a user session is indexed, making search one of FullStory’s most powerful features. FullStory records all the granular data that exists on the periphery of a session (for example: browser, IP location, time of visit, referrer URL, UTM parameters, etc.) and allows you to search for any combination of those attributes. We also record everything that renders in the browser and events therein, such as clicks, page navigations, field changes, typed text, and more. To begin asking questions of your data, simply start typing in the search omnibox at the top of the page. Pro Tip: Use the keyboard shortcut `ctrl+/` to jump directly to the search box. Once you click in the search field, you'll be presented with a quick launch menu of various things you can search for. You'll also see some tips that you can scroll through to get more search ideas. Pro Tip: You can hide these tips by clicking the gray 'Hide Tips' text. You can get them back later by clicking 'Show Tips'. Try typing anything and you'll instantly be given suggestions that match your typed characters. For example, if you're looking to find a user named Joe Schmo, start typing `J o` . We'll intelligently surface the top search hits for various fields that contain 'jo' and then you can click on the one that matches your intent. 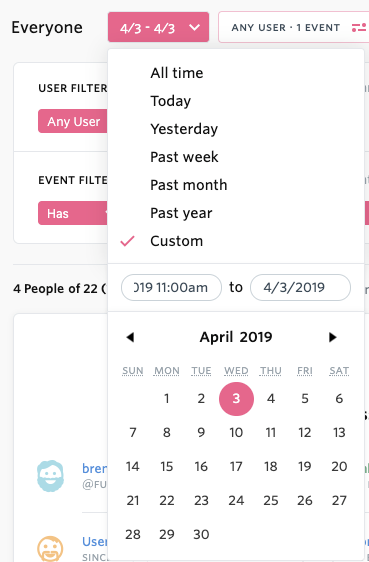 Date & Time constraints let you narrow down your custom search to a particular period of time, such as only results from last week, or the day you introduced a new feature. You can also add time constraints to the custom date fields using the format MM/DD/YYYY HH:MM. User count shows you the percentage of users who match your search out of the total number of visitors to your site. This number will show at the top of the search query and will update each time you modify your search. One of FullStory’s most powerful features is its ability to automatically index every resource that loads in the browser, making those elements searchable based on their CSS selector. Every element on your page has a CSS selector (either an object type, class or ID) that identifies that object in the Document Object Model (or “DOM”). If you're unsure what a CSS selector is or how to find it, the best way is to use our Inspect tool. Once you've zeroed in on your desired sessions, save your search by using the 'Save segment...' button. You'll get a pop up menu that asks you to enter a name for your segment. Once you have saved a segment, you will then have access to the segment options bar. This menu bar will allow you to rename a segment, duplicate a segment so you don't have to start from scratch, or delete an old segment. You can also add the selected segment to your e-mail digest. Your segments will be saved to the left-hand toolbar in the FullStory window. Some convenient segments have already been created for you. Your custom segments will be added to the My Segments section. You can also view all custom searches created by your team under Team Segments. 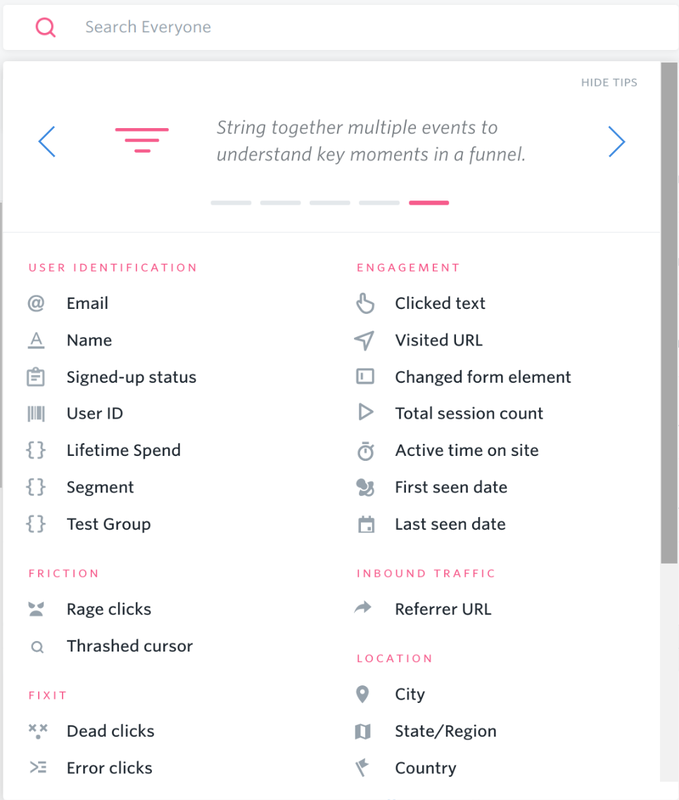 Use the "Find Segment" filter at the bottom of the segments list to quickly find you or your teammates saved searches.